The news comes soon after a publicised dispute broke out between Surkov, widely seen as the creative force behind the Skolkovo innovation hub, and Investigative Committee spokesman Vladimir Markin. 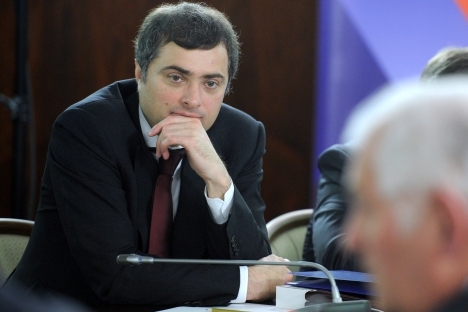 Vladislav Surkov has resigned from his post as deputy prime minister, the Kremlin press service reported Wednesday on its site, citing a presidential decree. Surkov wrote a request to resign following a meeting Putin held with government ministers on Tuesday, Putin’s press secretary, Dmitry Peskov, was quoted by Itar-Tass as saying. During the meeting, Putin had criticised them for failing to implement his election promises. The news comes soon after a publicised dispute broke out between Surkov, widely seen as the creative force behind the Skolkovo innovation hub, and Investigative Committee spokesman Vladimir Markin. Earlier Surkov had spoken out in defence of Skolkovo, whose senior executive is under criminal investigation on suspicion of embezzling $750,000. In an op-ed column in Izvestia Tuesday, Markin lashed out at Surkov over his speech, which he made at the London School of Economics. Surkov was one of the masterminds of the Skolkovo innovation centre and is a member of its board of trustees. Peskov denied that the Skolkovo investigation had anything to do with Surkov’s resignation. “He left on his own initiative. It is connected… with the implementation of the president’s decrees,” Kommersant quoted him as saying. Surkov joined the Kremlin in 1999 as an aide to the chief of staff. Later he emerged as the Kremlin’s chief ideologue in his post as first deputy chief of staff, a post that he continued to hold under President Dmitry Medvedev. In December 2011, Surkov changed jobs and joined Prime Minister Medvedev’s government as deputy prime minister, following a spate of unprecedented anti-government protests. The news of the resignation has disappointed members of Moscow’s Indian community. Surkov, a known admirer of Bollywood, has spoken of his love for Hindi cinema.